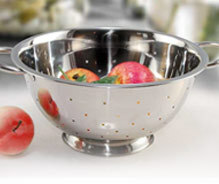 You can choose from below, our unique collection of colanders such as stainless steel colanders and fruit colanders made of fine quality stainless steel. These SS colanders feature perforated designs and strongly contoured & comfortable to grip handles. 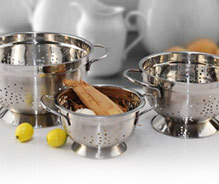 They are must have for every kitchen, be it traditional or contemporary. We offer stainless steel colanders, stainless steel kitchen colanders, stainless steel fruit colanders, vegetable colanders, food colanders, perforated colanders and many others. We offer a functional range metal colanders that are used for draining pasta, fruits or vegetables. 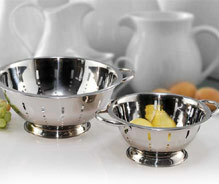 These colanders have stainless steel mirror finish and have a non sticky base. Our range of colanders have specially designed handles for perfect grip. We offer an exclusive collection of colanders that can be used as a centerpiece on the dinning table. These colanders are made from durable and corrosion resistant stainless steel. 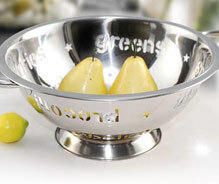 Our fruit colander is designed with broad base for stability on the flat surfaces. 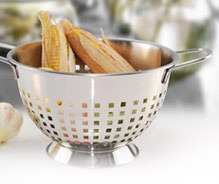 Long handle strainer colanders brings the cooking essentials with style and sophistication. 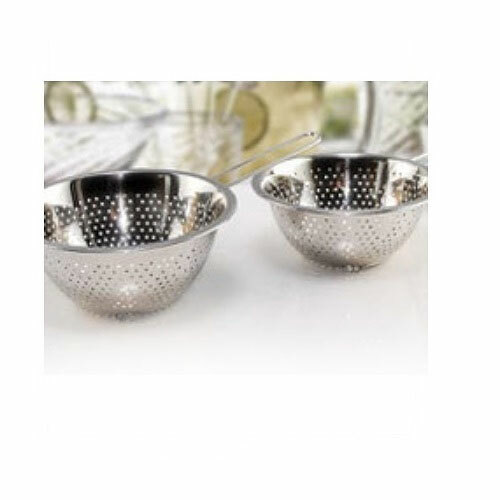 These strainers have very fine perforation throughout the base and body. Our range of long handle strainers are ideal for making jams, soup,etc. 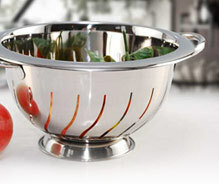 We offer an elegant range of colanders made from quality stainless steel. These colanders are especially useful for rinsing vegetables, fruits and draining food items. Rows of drainage holes ensure perfect performance and handles make it easy to grip, as you shake out excess water. Our range of deep colanders features a unique shape and perforated surface in the form of wire mesh. These colanders are perfect have long handles for convenience of the user. The broad base of the colanders provide ultimate stability on every flat surface. We offer a unique range of stainless steel colanders / names colanders that are ideal for straining all kinds of vegetables, fruits, beans and pasta. These colanders can be perforated with names on the surfaces to give a personalized touch. Our range of colanders is also perforated at the base for quick drying and straining. Our wavy colanders are perfect for draining pasta, washing veggies or fruits. These colanders have artistically perforated surface in the form of waves. The broad rim and handles of the colanders provides convenience of use along with perfect grip. Our range of German colanders can be used to accentuate the dinning table as a decorative piece. These colanders provides quick drainage of water and a perfect grip with handles on both the sides. 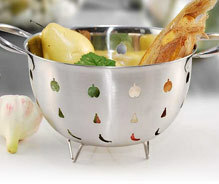 Made from quality stainless steel, the German colanders have excellent exterior mirror finish and brushed interiors.